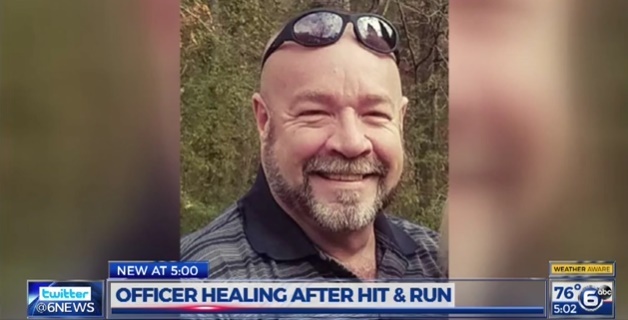 The Kingston (TN) Police Department is asking for prayers for one of their officers that was hit Sunday night during a traffic stop. Sergeant Jerry Singleton was injured while conducting a traffic stop on a truck pulling a car hauler, according to Kingston police. “Jerry walks up, says, ‘Evening, sir, how you doing? I need to see your driver license.’ Just in a split second, the guy says ‘I don’t have any.’ Throwed it down in drive and took off,” described Kingston Police Chief Jim Washam. Chief Washam says Sgt. Singleton was hit by the hauler, which caused him to fall in the road, reports WATE. Sgt. Singleton was taken to University of Tennessee Medical and is awaiting surgery due to knee injuries, according to police. He is listed in stable condition. A suspect in the hit-and-run, Henry Nicholas Brown, was later arrested and faces multiple charges.